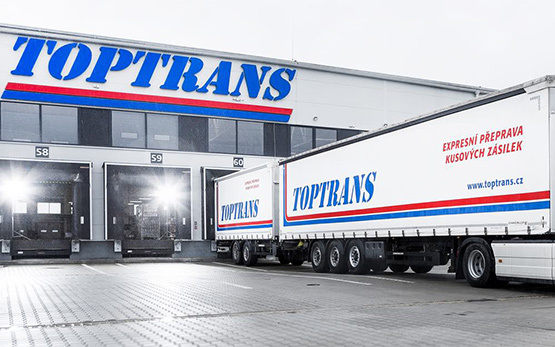 In August 2008 we began a partnership with TOPTRANS, which provides us with delivery of shipments direct to our customers' doors anywhere in the Czech Republic and Slovakia. Since then, we have been able to substantially reduce shipment delivery intervals and increase the success of delivery at the first attempt. In the Czech Republic and Slovakia, Toptrans is a leading provider of express delivery and logistics solutions. Among express carriers, they have the densest network of facilities (25 depots in the Czech Republic and 6 in Slovakia). The company offers its services B2B to companies (e.g. shipping between manufacturers and wholesalers), B2C for companies and end clients (internet shops) as well as C2C for households and consumers (e.g. auction systems). Thanks to their dense network of branches, Toptrans can deliver shipments within the Czech Republic and the Bratislava, Slovakia area within 24 hours, and to the rest of Slovakia within 48 hours.